Listing a token on an exchange is an important milestone in the roadmap of every crypto project. This is simply because being listed on a top cryptocurrency exchange greatly increases the chance of success due to the higher potential of increasing value and better access to investors. Just the rumor alone of Ripple preparing to be listed on Coinbase was enough to cause a 5% surge in price a year ago, and when XRP coin was actually listed, it went up by 10%. The influence of exchanges on coin perception and value cannot be overestimated. However, this is not the case with listing fees. They can often be overestimated and overwhelming, reaching millions of dollars according to some reports. Jonathan Zeppettini, International Ops Lead at Decred, claimed that he was asked for $3M from an exchange which had not even launched at that moment. That is how they evaluated the great honor of being among the first listed projects. What is the price a project has to pay to put their coin or token on an exchange? Is it possible to avoid extra charges? What other requirements are applied to listing on the top exchanges? Find all the answers in the latest Coin360 research on cryptocurrency exchange listing fees. The centralized exchange, Binance’s listing fees policy went through some changes 6 months ago. Now, all listing fees are transparent and 100% of the money received for listing is transferred to Binance’s own charity fund, Blockchain Charity Foundation. In an announcement made on Binance’s website, the team also referred to how fees are set; the teams behind each project are the ones that propose the number they want to donate. There’s no minimum, and a big donation does not have any effect on the outcome of the listing review process. 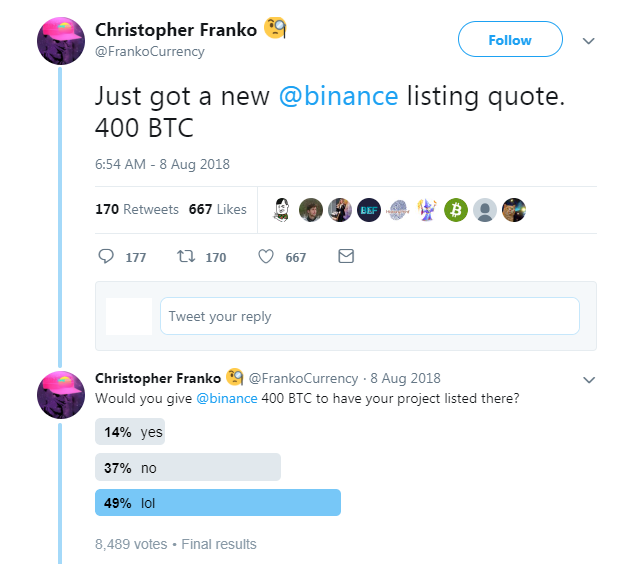 Different articles on the web and social media say different things, like a tweet from Christopher Franko, a co-founder of the Expanse platform, saying he got a Binance listing quote and it was 400 BTC. With the coin at $6,5k at that time, that amounted to a total of $2,6 million approximately. Changpeng Zhao, the CEO of Binance, claimed that Franko got a spoofed/spam e-mail, and it was definitely not from Binance officials. 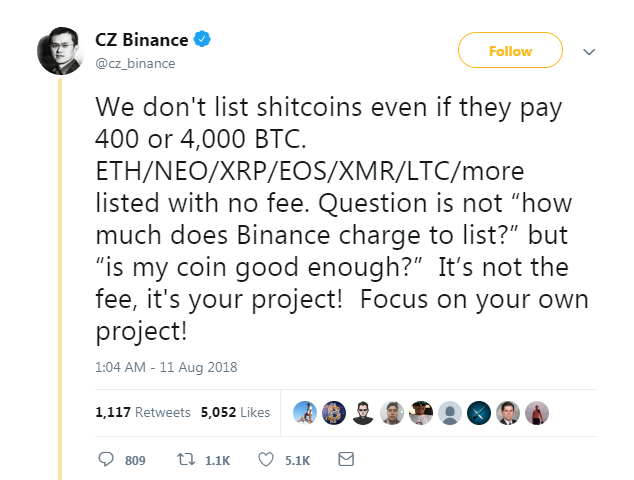 He didn’t stop there and went on, saying that Binance doesn’t list sh*tcoins no matter how much they pay for that. As a response, Franko published this screenshot of the e-mail he had got; as you can see it was sent by someone with a @binance.com mail domain. Franko claimed that it was Binance’s right to charge such exorbitant fees, but he was outraged by the pretense. Another huge listing fee has even left a trail on Etherscan. Credits (CS) transferred around 2000 ETH to an account which is considered to be Binance’s in March and August of 2018. Given the ETH prices at that time, it makes a total of almost $1M. The funds were later transferred to Binance’s official wallet, which makes us think it was a fee to list CS on the exchange. However, Credits is still not listed on Binance. Perhaps, these cases, which became known to the public, prompted Binance to implement new listing rules. Binance recently added another service to the brand – Binance DEX, its decentralized exchange. This exchange, however, has different policies regarding listing fees. Binance’s CEO, Changpeng Zhao, stated in an online stream held in January that the listing fees for the new exchange would be around the $100k mark. This entry barrier is deliberate and is meant to “reduce the number of spam or scam projects”. In addition to a listing fee, there is also a voting process involved, where the community is said to have a vote regarding new listings on the DEX. 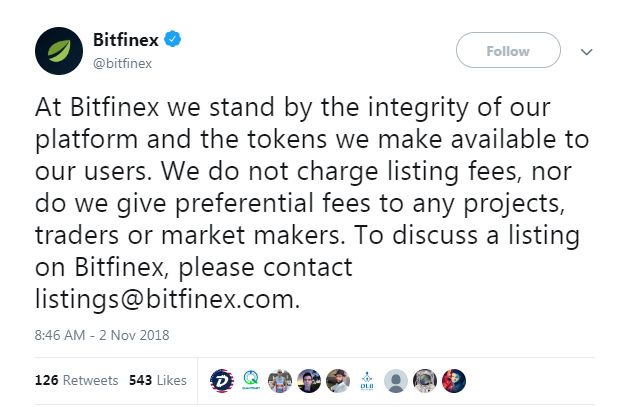 Some top-tier exchanges decided to totally reject listing fees. For example, OKEx, a Malta-based cryptocurrency exchange with an over-$500M daily adjusted volume doesn’t charge a cent for listing. Though, this doesn’t mean that you can put your coin on the cryptocurrency market without having any money in stock. “We don’t charge any listing fee, but get your budget prepared,” says Andy Cheung, the Head of Operations at OKEx. Instead of a listing fee, OKEx requires a security deposit which is returned if the project completes the listing process successfully. OKEx’s, relatively, new listing regime (it was actually applied 10 months ago) includes 3 options: Vote, Collaboration, and Community Building. All applications for the token listing vote will be reviewed by a special committee, then the Prime Investors and holders of OKB (the native token of OKEx) will be able to vote for crypto projects. One vote costs 0.1 OKB, and all tokens are returned to holders after the vote ends. Collaboration regime implies the listing of projects that received investment from OK Blockchain Capital and 5 OKEx Prime Investors. Finally, the Community Building regime requires a project to bring 50,000 new users to OKEx, and at least 20,000 of them have to be active (i.e. have a minimum of 1 ETH in their accounts and trade regularly). ZB.COM ZB.COM, a Chinese cryptocurrency exchange with a daily adjusted volume of $613M at press time, also uses a voting mechanism to choose new coins to list. Listing applications have to be approved by so-called ZB Professional nodes: these are companies that secure the efficiency of ZB.COM and maintain the project. After the coin is supported by the ZB nodes and gets at least 3 votes from them, the crypto project team needs to bring no less than 5,000 new users to the exchange. After that, the public voting procedure starts – 1 vote costs 1 ZB Token, and users can vote for more than 1 coin at a time. After the project wins the vote but before it is listed, it is necessary to pay 2,000,000 ZB tokens as a security deposit. However, this “security deposit” will not be refunded, as it reads on ZB.COM website, which makes it actually a normal listing fee; with a current price of $0.38 per token, it equals to $760,000. If a crypto project is considered risky, this money will be used to compensate those who voted for it. If a project is successfully listed, this money will be returned to users via airdrop. Bitfinex, a cryptocurrency trading platform based in Hong Kong, has definitely seen better times. It used to be one of the biggest exchanges in terms of cryptocurrency trading volume, but at the moment it only takes a spot in the top-50 with an adjusted daily volume of $93M. The exchange suffered multiple security breaches, which resulted in several hacks; the largest of which took $72M from its customers’ accounts in 2016. Compared to top-tier exchanges, Cryptopia’s listing fees are really small. What is special about this exchange is that it has the listing fees listed on the website, in the open, unlike other exchanges. The listing fee for an ERC-20 token is 2,500,000 DOT, the exchange’s own coin, currently trading at $0.0056 approximately. The price for listing a coin is 4,000,000 DOT. This translates into $14k and $22.4k respectively. Earlier this year, the NZ exchange was hacked. On Jan. 14 Cryptopia went offline and their Twitter stated that they were experiencing “an unscheduled maintenance” that went on until the 15th, when they announced that the exchange had been hacked, which led to significant losses, and the exchange was kept in maintenance mode. Cryptopia was down for more than 2 months, but it resumed trading on Mar. 20. As the Blockchain Transparency Institute revealed in their 2018 report, the average blockchain project spent $50,000 on listing fees. This means that most listing fees are not exorbitant, and most crypto exchanges do not charge $1M for listing. Top-tier crypto exchanges have no lack of new coins willing to be listed and are able to choose carefully and place greater demand on new crypto projects (including greater listing fees). Vitalik Buterin, though, is not satisfied with the current status; during the TechCrunch Sessions he claimed that all centralized exchanges with their “crazy listing fees” should “burn in hell as much as possible”. Why are high listing fees bad for the whole crypto industry? First, exchanges can start listing scammy unreliable projects simply out of the desire for money. Second, some high-quality projects won’t be listed, as they have more talent and expertise than cash. This is not expected to change soon, as even so-called “decentralized” exchanges are not willing to list coins for free.